Moderate fat - helps avoid weight gain. Increased fibre - increases dietary bulk to aid satiety and reduce hunger. 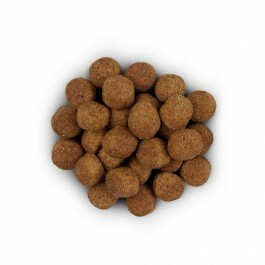 Controlled protein, calcium, phosphorus and sodium - avoids excessive intake making this food appropriate to be continued when dogs become older. Maize, brewer's rice, flaxseed, pea bran meal, soybean meal, chicken and turkey meal, maize gluten meal, digest, cellulose, dried beet pulp, animal fat (pork), fish oil, minerals, L-carnitine,cartilage hydrolysate (source of chondroitin sulphate), crustacean shell hydrolysate (source of glucosamine), vitamins, trace elements and beta-carotene. Naturally preserved with mixed tocopherols and citric acid. 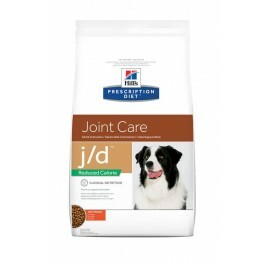 Hill's Prescription Diet j/d Canine Reduced Calorie should be recommended by your veterinary surgeon. For detailed information on feeding amounts and how this food can help your pet, please consult your veterinary surgeon. Exclusively feed the recommended Prescription Diet food and keep fresh water availalbe at all times. Please note that this is a guide only and that individual animals may have different requirements. Adjust the feeding amount to maintain the optimal body weight.